Yesterday, we set out to climb Rumija mountain, well a goodly part of its 1,595m. The mountain tops were still snow-covered but the target was to reach the steep beech forests at around 1,200m. 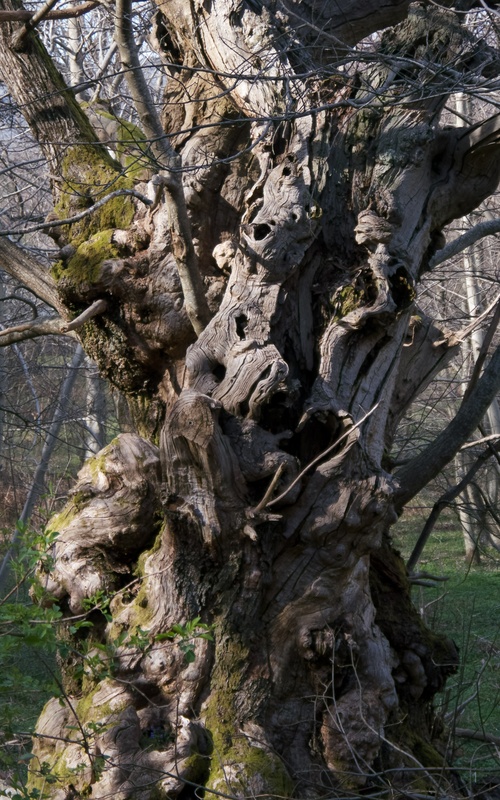 We began in the ancient sweet chestnut woods and followed the way-marked path, passing through the hamlet of Gornji Briska. The only sign of life being a tethered goat and large, long-haired ewe. 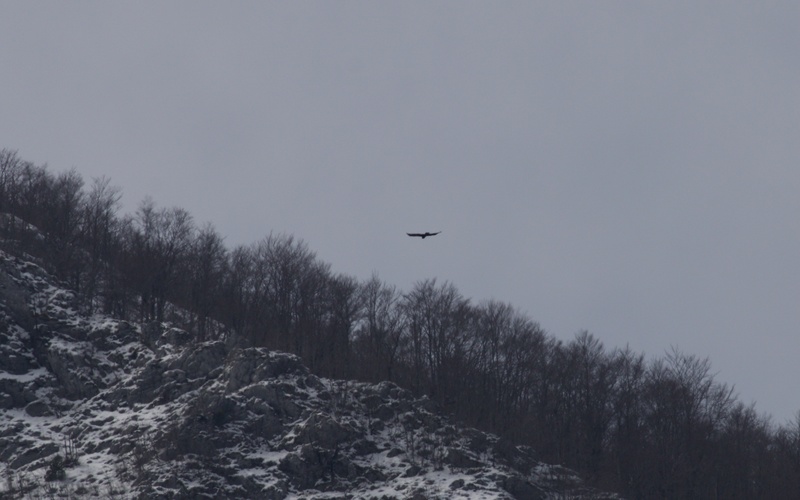 We spotted a distant golden eagle circling the mountain and I hoped it may have a nest in the high beeches. 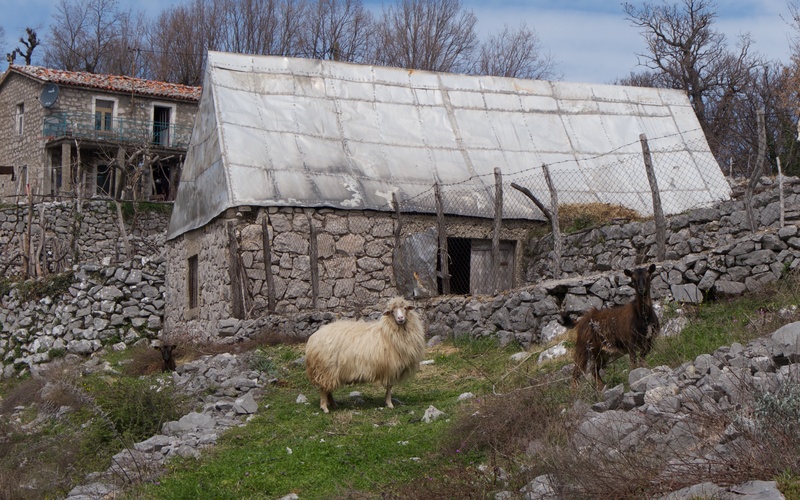 Livestock in Gornji Briska and distant golden eagle over the high beech forest. The path lost us after a kilometre or two, where it appeared to run through a gap in the stone wall to a long disused well but in fact skirted a stream. We ploughed on when we should have doubled back and spent an hour or so fruitlessly searching for the route. 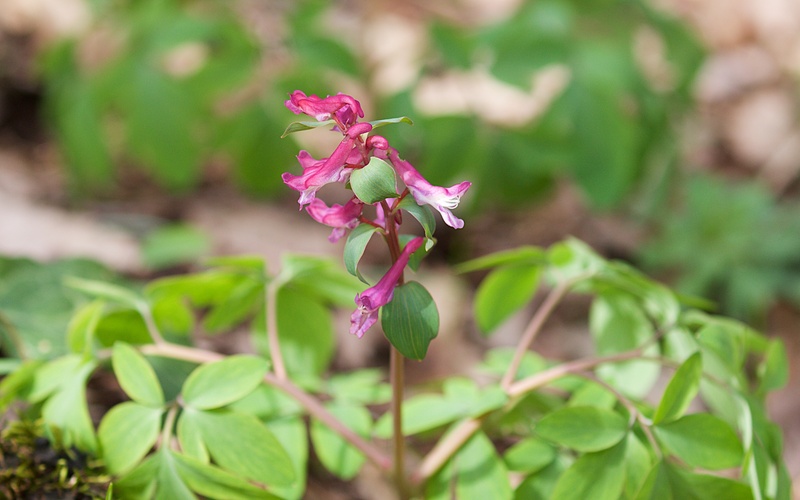 However, when not clambering stone walls or fighting through oak scrub, we found two interesting plants in the abandoned and now wooded terraces: the first was field pansy (Viola arvensis) and the second the attractive Corydalis cava with reputed medicinal uses. 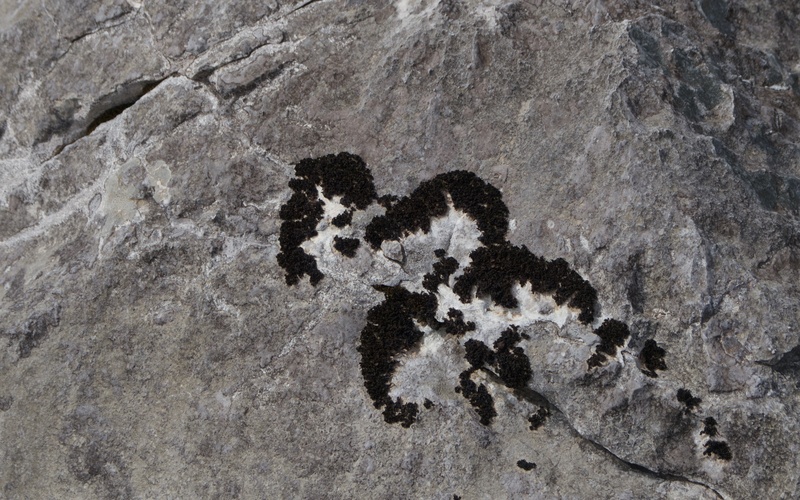 We also admired the variety of lichens on the limestone from pink to white and a wonderful black one. 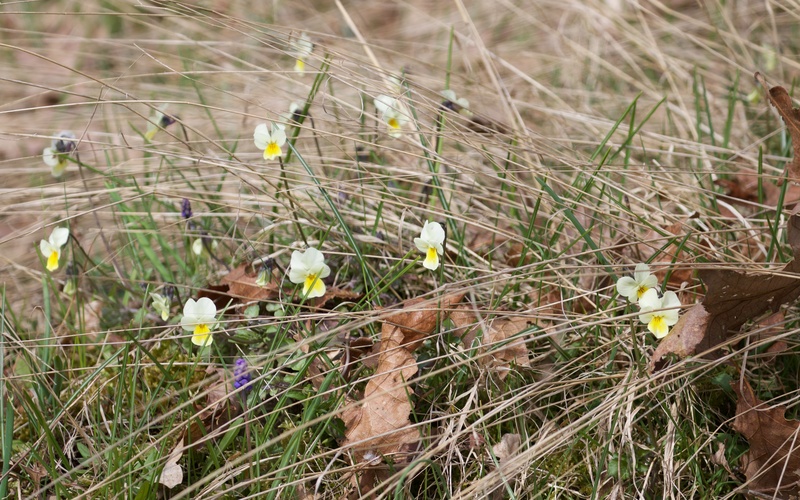 Field pansy and Corydalis cava. With some relief, we re-found the path and walked on up passing a handful of Early Star-of-Bethlehem (Gagea bohemica) and abundant sweet violet (Viola odorata), grape hyacinth (Muscari neglectum) and swathes of bright blue Anemone blanda and eventually reached an altitude, still in the oak-hornbeam, where Crocus were still out. 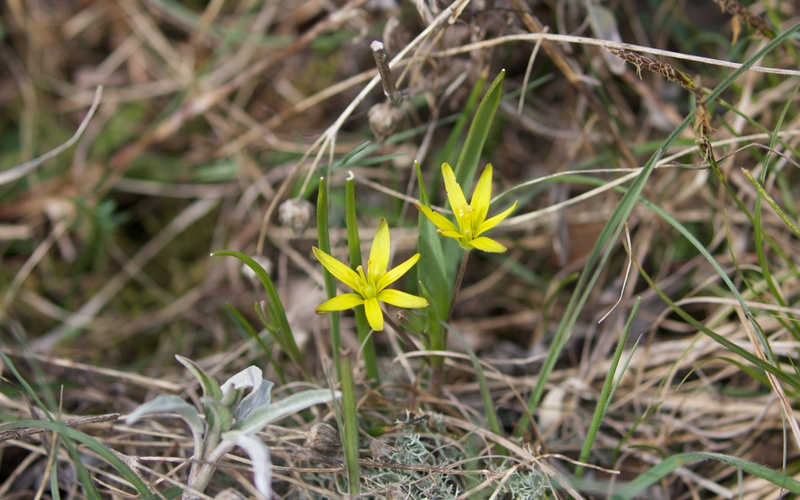 Gagea bohemica is only found in one small site in the UK, at Stanner Rocks in Radnorshire, and hence is known as the Radnor lily. It is an interesting paradox that species on the edge of their range, and as a consequence rare, often attract much more attention from ecologists than when they are common and everyday at the core of their range. The UK on the edge of Western Europe unsurprisingly has a host of edge of range species and all, of course, are much prized. 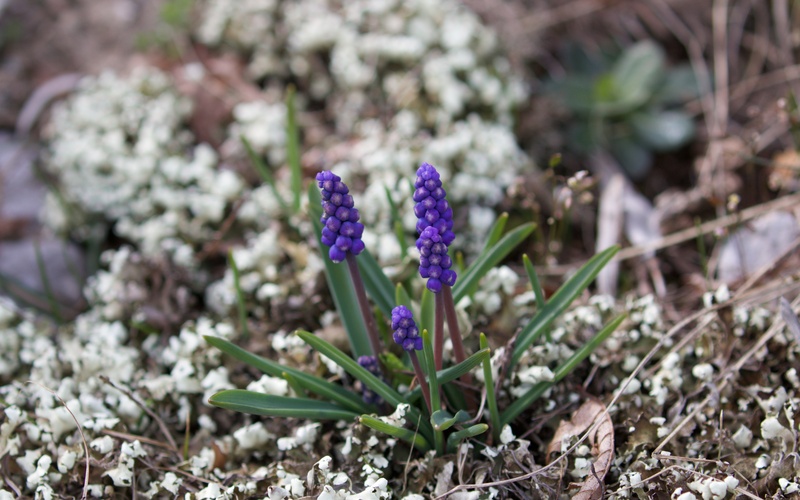 Early Star-of-Bethlehem or Radnor lily and grape hyacinth amongst lichen. The time was 3pm and the light was wonderful but we turned for home still having most of the mountain to climb. 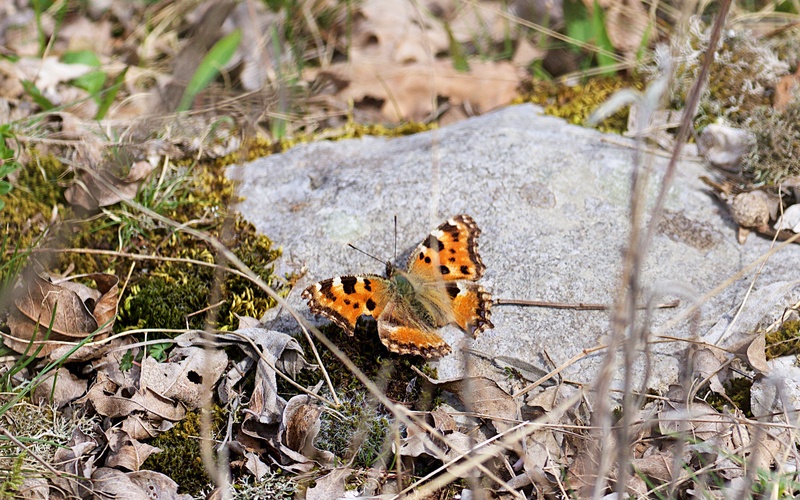 On the way down, we just caught a large tortoiseshell (Nymphalis polychloros) sunning itself before it flew. The chestnuts were quiet and huge and we only heard a distant green woodpecker before reaching the car. Large tortoiseshell – freshly emerged but tatty after overwintering.